St. Hilare was a lawyer who went on to study medicine, and a revolutionary who managed, during the bloody Reign of Terror in France, to save, not only himself, but also his own teachers and fellow students and faculty, from the blade of the guillotine. His first professional appointment, at the Jardins des Plantes in Paris, as vertebrate zoologist, soon became the same position at the revolutionarily renamed Museé National d’Histoire Naturelle. He brought the great paleontologist Georges Cuvier to Paris, where the two collaborated on research projects. When Napolean invaded Egypt in 1798, St. Hilaire went along as a naturalist, and he returned with cats and birds (all mummified) which he had lifted from ancient desert tombs and burial sites. By 1809, the l’Université de Paris had made him professor. As Darwin notes, no biological researcher before St. Hilaire had seen this remarkably important concept; however much the precise form or function may change, the anatomical parts and their relations to each other remain the same until some force (for Darwin that force is random mutation) enters in and alters these fundamental relationships. So nature is composed of absolute forms which only alter over time, for Darwinian evolution these changes occur under the conditions of natural selection based on chance mutation (Darwin, of course, still did not know about genes or chromosomes or the mechanics of mutation; that information would await the modest monk Gregor Medel and his researches into twining pea-pods in the 20th century: 1901!). 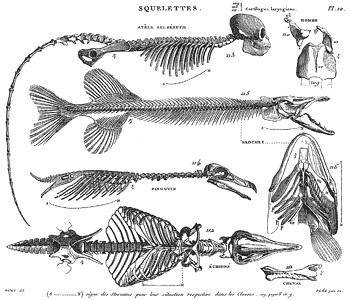 In his own time, Geoffroy went so far as to understand that the exoskeletons of insects, crustaceans, and other arthropods were actually just the vertebrae and spinal structures of vertebrate creatures, turned “inside-out” as it were. A lobster’s exterior body “is,” in one sense, his rigid spinal structure opened up to contain his soft organs (stomach, heart, and intestines). Even a turtle’s shell is actually composed of his ribs, in the turtle’s case on the outside and flattened into a single protective structure that, once again, holds and protects his soft inner-parts. The turtle has even developed a lower plastron underneath (the carapace on top, the plastron underneath) to connect his top and bottom exoskeleton into a single protective “shell.” As Darwin might say, there is a perfect example of natural selection. St. Hilaire at the Strange Science hypertext site: a wonderful site for Romantic Natural History; its subtitle is The Rocky Road to Paleontology and Modern Biology. Here is its author’s own description, which suggest a clear connection to the “Romantic” elements of Romantic Natural History: “Ever wonder how people figured out there used to be such things as dinosaurs? Curious about how scientists learned to reconstruct fossil skeletons? The knowledge we take for granted today was slow in coming, and along the way, scientists and scholars had some weird ideas.” These “weird ideas” are among those that Romantic Natural History traces; once Darwin offers such a coherent and thorough explanation for the sources and history of life, the “Romantic” element begins to vanish and “natural history” becomes a legitimate, and verifiable (repeatable) science.